Storage pits abound in Danebury Ring: 2,400 have been discovered during the excavation so far and we might expect another 2,000 in the unexcavated area. The pits take a variety of shapes and sizes but fall into three basic cate­ gories: pits of circular plan; pits of sub-rectangular plan; and pits of conical profile. Of this third group only seven have been found and all showed signs of having been used for storing and mixing clay. The rectangular pits are comparatively rare, amounting to only about 7 per cent of the total; the majority belong to the early period. Three were found fitted neatly into an early house, CS9, preserved by the extension of the rampart on the north side of the fort, in a manner suggestive of their having been storage cellars. That the sub­ rectangular pits were vertical-sided would have made them unsuitable for the long-term storage of grain because they would have been difficult to seal, but other commodities could more easily have been stored in them. Image 01- Intercutting pits of various dates. Image 02- Blocking wall of chalk lumps built to revet the loose filling of the pit into which the near pit was cut. Image 03- Adze marks on the bottom of a pit. The great majority of the pits were circular in plan and were of two sub­ types: cylindrical pits with near vertical sides; and beehive pits with undercut sides causing the pit to widen out at the bottom. There were more than four times as many beehive pits, 72 per cent of the total, as there were cylindrical pits. Most of the pits had been left open after use and had become filled with a mixture of rubbish, together with silt and chalk eroding from the sides. In this process the upper part of the pit walls had usually crumbled away, completely altering the profiles, but a few, by virtue of their sheltered positions in the quarry hollows and very rapid filling, had preserved their profiles exactly as they were when originally dug. A very good example is pit 1115 (see image 04). It was nearly 3m (10ft) deep, 80cm (18in) wide at the mouth and 2.4m (8ft) wide at the base, with its walls and floors cut completely smooth. Even more interesting is the fact that the layers around the top of the pit were also well preserved. Chalk rubble had been piled up to form a rim, the pit itself opening as a crater in the centre. More chalk rubble had been added to the rim during the life of the pit. One further detail of note is that several post-holes around the pit top could have supported a shelter over the opening. All these arrangements may seem inexplicably over-elaborate until the question of how these pits are thought to have functioned is considered. The most likely explanation is that they were used to store threshed corn. The concept of tipping corn into a damp pit in the chalk might at first sight appear ill-advised but experiments have shown that it can be a highly effective method of storage so long as the top of the pit is provided with an airtight seal. What happens is that immediately the pit is sealed the grain in contact with the pit side begins to rot, a process which uses up the oxygen in the pit and gives off carbon dioxide. The percentage of carbon dioxide continues to increase to a point at which it kills off the bacteria and fungi causing the rotting and thus the internal atmosphere becomes self-sterilising. From this point on the atmosphere is stable and the pit contents are safe from further disintegration until the airtight seal is broken. 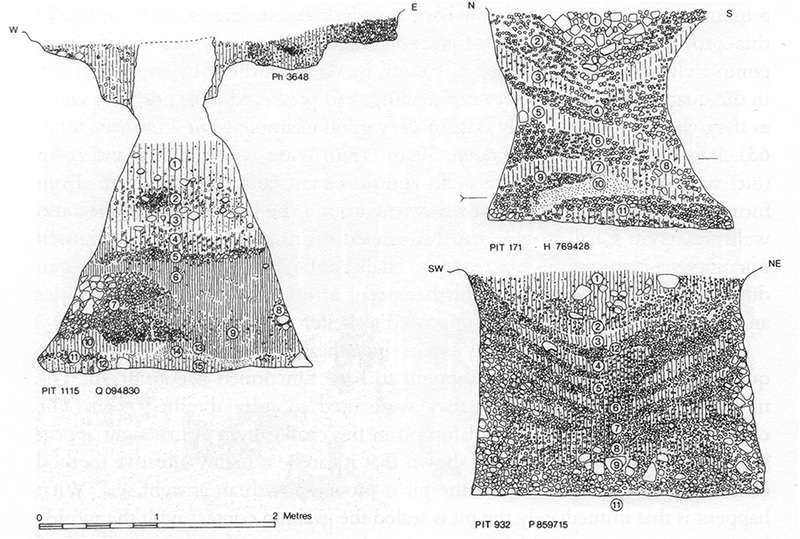 Image 04 – Three pit sections showing the silting patterns resulting from weathering of different intensities. When the pit is opened, even a year after the original sealing, the mass of the grain will be quite fresh for consumption or for use as seed, the only waste being a thin crust, 1-2cm (1in) thick, against the pit sides and bottom which, anyway, could be put to good use as cattle feed. The essential part of the scheme is the airtight seal: clearly the narrower the pit mouth the better. The beehive shape, therefore, is the result of the two prime requirements: a narrow pit mouth and a large volume. The advantage of the cone of chalk piled around the pit top is probably that it prevented seepage of surface water and allowed a thickness of soil to be piled over the lid increasing the quality of the seal. The post-holes would have been useful to support a shelter against the weather at the crucial times when the pit was being filled and emptied. It is also possible that they anchored some kind of lifting gear. For the most part the pits were dug with considerable skill with the aid of an iron adze the marks of which are often still apparent on the pit walls and bottoms (see image 03). Although the task seems daunting, it is estimated that two or three men working for a day could complete an average-sized pit with ease. The technique seems to have been to start the belling out immediately to increase working space, but as the pit deepened a pedestal of chalk was sometimes left undug presumably as an aid to passing out baskets of rubble: only later would it be finally removed. Evidence for all these stages is found in the small number of unfinished pits at Danebury. With so many pits dug in such a restricted space over the 400 years or so of occupation it is inevitable that pit-diggers should sometimes break into old silted-up pits long forgotten. Even if the new pit were begun in a surface of undisturbed chalk, by belling out it might soon encounter a neighbouring feature. Occasionally at this stage the new pit was abandoned but more often it was completed and the imperfect side made good with a wall of chalk blocks (see image 02) or occasionally flints set in clay. There were certain changes with time. It has already been noted that rectangular pits were restricted to the early period. The actual number of pits also declines but this does not mean that the pit storage capacity decreases in parallel because the average volume of the pits actually increases with time from 2.18 cubic metres (77 cubic ft) in ceramic phase 3, to 4.35 cubic metres (154 cubic ft) in ceramic phase 7-8.